Seen from an abstract level, there are two co-existing development lines in space polices and programmes. One is consolidation of projects and efforts already set out and pursued before. The other one is the search and decision for new goals and strategic objectives. In both cases, the trend towards international cooperation is being reinforced. Cooperation schemes often include emerging space actors. “International Cooperation with the USA.” 12 Dec. 2009. European Commission. 13 Jan. 2010. http://ec.europa.eu/enterprise/policies/space/esp/international-cooperation/usa/index_en.htm. “International Cooperation with Russia.” 12 Dec. 2009. European Commission. 13 Jan. 2010. http://ec.europa.eu/enterprise/policies/space/esp/international-cooperation/russia/index_en.htm. ESA and Arianespace Sign a Frame Contract For the Procurement of Launch Services. 15 June 2009. ESA. 19 Aug. 2009. http://www.esa.int/esaCP/SEMAP73XTVF_index_0.html. Rathgeber, Wolfgang. 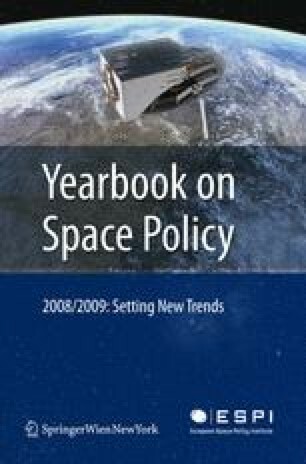 “Space Policies Issues and Trends in 2008/2009.” 18 May 2009. ESPI Report 18. 19 Aug. 2009. http://www.espi.or.at/images/stories/dokumente/studies/espi%20report%2018.pdf. ESA website. 19 Aug. 2009. http://www.esa.int/. Bigot, Bernard/ d’Escatha, Yannick and Laurent Collet-Billon. “L’Enjeu d’une Politique Européenne de Lanceurs: Assurer Durablement à l’Europe un Accès Autonome à l’Espace. ” 18 May 2008. 11 Aug. 2009. http://lesrapports.ladocumentationfrancaise.fr/BRP/094000223/0000.pdf. “ESA Signs High Thrust Engine Demonstrator Contract for Next Generation Launcher.” 17 June 2009. ESA. 19 Aug. 2009. http://www.esa.int/esaCP/SEMHBUZO0WF_index_0.html. “NASA Awards Space Station Commercial Resupply Contracts.” 23 Dec. 2008. NASA Press Release C08-069. 20 Aug. 2009. http://www.nasa.gov/home/hqnews/2008/dec/HQ_C08-069_ISS_Resupply.html. SpaceX website. 20 Aug. 2009. http://www.spacex.com/. Orbital Sciences Corporation website. 20 Aug. 2009. http://www.orbital.com/. “Russia to Test Launch Angara Carrier Rocket in 2011.” 19 Mar. 2009. Space Daily. 20 Aug. 2009. http://www.spacedaily.com/reports/Russia_To_Test_Launch_Angara_Carrier_Rocket_In_2011_999.html; “Rockets: Angara Family.” Russianspaceweb. 20 Aug. 2009. http://www.russianspaceweb.com/angara.html. Russianspaceweb website. 20 Aug. 2009. http://www.russianspaceweb.com/ppts_lv.html. “Centers: Svobodny.” Russianspaceweb. 20 Aug. 2009. http://www.russianspaceweb.com/ svobodny.html. JAXA website. 20 Aug. 2009. http://iss.jaxa.jp/en/htv/index.html. Bigot, Bernard/ d’Escatha, Yannick and Laurent Collet-Billon. “L’Enjeu d’une Politique Européenne de Lanceurs: Assurer Durablement à l’Europe un Accès Autonome à l’Espace.” 18 May 2008. 11 Aug. 2009. http://lesrapports.ladocumentationfrancaise.fr/BRP/094000223/0000.pdf: 17. “Long March 5 Will Have World’s Second Largest Carrying Capacity.” 4 Mar. 2009. Space Daily. 20 Aug. 2009. http://www.spacedaily.com/reports/Long_March_5_Will_Have_World_Second_Largest_Carrying_Capacity_999.html. “New Space Launch Center to Be Built in China’s Southernmost Hainan.” 3 Mar. 2009. Space Daily. 18 Aug. 2009. http://www.spacedaily.com/reports/New_Space_Launch_Center_To_Be_Built_In_China_Southernmost_Hainan_999.html. Subramanian, T. S. “An Indian Space Shuttle Takes Shape.” The Hindu 1 Apr. 2009. 20 Aug. 2009. http://www.hindu.com/2009/04/01/stories/2009040161821100.htm. Shin Jenny. “Chronology of North Korea’s Missile Flight Tests.” 13 July 2009. Center for Defense Information. 21 Aug. 2009. http://www.cdi.org/pdfs/NKMissileTestTimeline7.16.09.pdf. Shine, Jenny. “A Chronology of Iran’s Space Activities.” 2009. Center for Defense Information. 21 Aug. 2009. http://www.cdi.org/pdfs/IranSpaceTimeline09.pdf. Kim, Tong-hyung. “Local Space Program Hits Snag.” 8 Dec. 2008. The Korea Times. 21 Aug. 2009. http://www.koreatimes.co.kr/www/news/tech/2009/04/133_35754.html; Kim, Tong-hyung. “Rocket Launch Delayed Until July.” 12 Mar. 2009. The Korea Times. 21 Aug. 2009. http://www.koreatimes.co.kr/www/news/nation/2009/03/123_41199.html. “NASA Assigns Space Station Crews, Updates Expedition Numbering.” 21 Nov. 2008. NASA. 9 Dec. 2009. http://www.nasa.gov/home/hqnews/2008/nov/HQ_08-306_Expedition_crews.html. “Europe’s Reaction to the Augustine Report.” Oct. 2009. ESPI, DGAP, FRS, IFRI, SWP, London Institute of Space Policy and Law. 10 Dec. 2009. http://www.espi.or.at/images/stories/dokumente/studies/joint%20memorandum%20_%20europe%5C%27s%20reaction%20to%20the%20augustine%20report.pdf. “Mission Accomplished.” 14 July 2009. ESA. 11 Dec. 2009. http://www.esa.int/esaMI/Mars500/SEMIS47CTWF_0.html. “KIBO Japanese Experiment Module.” October 2009. JAXA. 11 Dec. 2009. http://kibo.jaxa.jp/en/. Kallender-Umezu, Paul. “JAXA Focused on Kibo for Short Term; Long-Term Policy Uncertain.” Space News 2 Feb. 2009: 12. “About the Google Lunar X Prize.” 2009. X Prize Foundation. 14 Dec. 2009. http://www.googlelunarxprize.org/lunar/about-the-prize. “MoonLITE Mission Gets Green Light forNext Step.” 5 Dec. 2008. BNSC. 11 Dec. 2009. http://www.bnsc.gov.uk/10278.aspx. “EUROBOT Ground Prototype.” July 2008. Joanneum Graz. 11 Dec. 2009. http://dibcms.joanneum.at/projects/eurobot. “Life support Pilot Plant Paves the Way to Moon and Beyond.” 5 June 2009. ESA. 11 Dec. 2009. http://www.esa.int/esaCP/SEMKNIVTGVF_index_2.html. “Lunar Spacecraft Reaches its Final Orbit.” 13 Nov. 2009. European Space Agency. 10 Dec. 2009. http://www.esa.int/esaCP/SEM9X74DHNF_index_2.html. “SELenological and ENgineering Explorer KAGUYA.” Nov. 2009. JAXA. 14 Dec. 2009. http://www.jaxa.jp/projects/sat/selene/index_e.html. “China Able To Send Man to Moon Around 2020.” 12 Mar. 2009. Space Daily. 14 Dec. 2009. http://www.spacedaily.com/reports/China_Able_To_Send_Man_To_Moon_Around_2020_999.html. “Mars Orbiter Completes First Phase of Science Mission.” 11 Dec. 2008. NASA. 14 Dec. 2009. http://www.nasa.gov/mission_pages/MRO/news/mro-20081211.html. “Mars Phoenix Lander Finishes Successful Work on Red Planet.” 10 Nov. 2008. NASA. 14 Dec. 2009. http://www.nasa.gov/mission_pages/phoenix/news/phoenix-20081110.html. “NASA Selects Future Projects to Study Mars and Mercury.” 4 May 2009. NASA. 14 Dec. 2009. http://www.nasa.gov/home/hqnews/2009/may/HQ_C09_020_NASA_Salmon_Awards.html. “ESA Extends Missions Studying Mars, Venus and Earth’s Magnetosphere.” 10 Feb. 2009. ESA. 11 Dec. 2009. http://www.esa.int/esaCP/SEMACI05VQF_index_2.html. de Selding, Peter. “NASA Poised To Take Key Role in European ExoMars Rover Mission.” Space News 22 June 2009:1+; “NASA and ESA Establish a Mars Exploration JointInitiative.” 8July2009. NASA. 15 Dec. 2009. http://www.nasa.gov/mission_pages/mars/news/mars-20090708.html. “Russian Sample Mission to Martian Moon Delayed Until 2010.” 22 Sep. 2009. RIA Novosti. 14 Dec. 2009. http://en.rian.ru/science/20090922/156209097.html. “China to Launch Mars Space Probe.” 29 May 2009. Space Daily. 14 Dec. 2009. http://www.spacedaily.com/reports/China_to_launch_Mars_space_probe_999.html. “Cassini Equinox Mission: Introduction.” 2009. NASA. 15 Dec. 2009. http://saturn.jpl.nasa.gov/mission/introduction/. “NASA and ESA Prioritise Outer Planet Missions.” 18 Feb. 2009. ESA. 20 Dec. 2009. http://www.esa.int/esaCP/SEMPHGWX3RF_index_0.html. “Venera-D.” 2 Dec. 2009. Russian Space Web. 14 Dec. 2009. http://www.russianspaceweb.com/venera_d.html. “Messenger: The Extreme Machine.” 20 July 2004. NASA. 15 Dec. 2009. http://www.nasa.gov/missions/solarsystem/f_messenger-extreme.html. “Solar Dynamics Observatory-Exploring the Sun in High Definition.” 2008. NASA. 16 Dec. 2009. http://sdo.gsfc.nasa.gov/assets/docs/sdo_factsheet.pdf. “Ulysses overview.” 21 Aug. 2009. ESA. 16 Dec. 2009. http://www.esa.int/esaSC/120395_index_2_m.html. “Solar Orbiter.” 19 August 2009. ESA. 20 Dec. 2009. http://www.esa.int/esaSC/120384_index_0_m.html. “Discovery Mission: Kepler.” 2009. NASA. 17 Dec. 2009. http://discovery.nasa.gov/kepler.html. “NASA’s Spitzer Sees the Cosmos Through ‘Warm’ Infrared Eyes.” 5 Aug. 2009. NASA. 17 Dec. 2009. http://www.nasa.gov/mission_pages/spitzer/news/spitzer-20090805.html. “Hershel and Planck Commissioning Has Begun.” 21 May 2009. ESA. 16 Dec. 2009. http://www.esa.int/SPECIALS/Operations/SEME990OWUF_0.html. “Discovering the Stars.” Oct. 2009. CNES. 17 Dec. 2009. http://www.cnes.fr/web/CNES-en/1401-corot.php. “3rd Meeting of International Space Exploration Coordination Group.” 16 Mar. 2009. ESA. 20 Dec. 2009. http://www.esa.int/esaHS/SEMLU2JTYRF_index_0.html. “Multinational Agreement Signed to Carry Out Lunar Exploration.” 28 July 2008. Moon Daily. 11 Dec. 2009. http://www.moondaily.com/reports/Multinational_Agreement_Signed_To_Carry_Out_Lunar_Exploration_999.html. “International Lunar Network.” 2009. NASA. 20 Dec. 2009. http://nasascience.nasa.gov/missions/iln. “NASA and ESA Establish a Mars Exploration Joint Initiative.” 8 July 2009. NASA. 20 Dec. 2009. http://www.nasa.gov/mission_pages/mars/news/mars-20090708.html. “Space Business Review.” December 2008. Milbank. 14 Jan. 2010. http://www.milbank.com/NR/rdonlyres/B34A51C3-5450-463C-B8C1-008D261CD07A/0/December_2008_Space_Business_Review.pdf. Lesser, Hartley. “Insight: the European Union + MSS.” Sept. 2008. SatMagazine. 27 Aug. 2009. http://www.satmagazine.com/cgi-bin/display_article.cgi?number=318671572. Skyrocket website. 27 Aug. 2009. http://space.skyrocket.de/. Congressional Research Service. “Defense: FY 2009 Authorization and Appropriations.” 25 Feb. 2009. 27 Aug. 2009. http://www.fas.org/sgp/crs/natsec/RL34473.pdf. Center for Defense Information website. 27 Aug. 2009. http://www.cdi.org/. de Selding, Peter B. “Galileo Cost Overruns Passes European Commission Audit.” Space News 29 June 2009:15; “Galileo Global Nav System Examined by European Court of Auditors.” 1 July 2009. Satnews. 13 Oct. 2009. http://www.satnews.com/cgi-bin/story.cgi?number=1653440132. “Obama 2010 GPS Budget Calls for $1 Billion+.” 21 May 2009. Inside GNSS. 20 Oct. 2009. http://www.insidegnss.com/node/1512#Baseband_Technologies_Inc_. Gibbons, Glen. “What Race? What Competition? The Four GNSS Systems.” March/April 2009. Inside GNSS. 19 Oct. 2009. http://www.insidegnss.com/node/1425#Baseband_Technologies_Inc_; “Air Force May Be Able to Fix Problem With Latest GPS Satellite.” 16 June 2009. Inside GNSS. 19 Oct. 2009. http://www.insidegnss.com/node/1573#Baseband_Technologies_Inc_. “Upcoming Block II-R (21)M Launch Wraps Up Generation of GPS Satellites.” 6 Aug. 2009. Inside GNSS. 19 Oct. 2009. http://www.insidegnss.com/node/1622#Baseband_Technologies_Inc_. “AFSPC Exceeds Global Positioning System (GPS) Standard.” 26 May 2009. GPS Daily. 19 Oct. 2009. http://www.gpsdaily.com/reports/AFSPC_Exceeds_Global_Positioning_System_Standard_999.html. “Lockheed Martin GPS III Team Completes Major Design Review.” 25 May 2009. GPS Daily. 20 Oct. 2009. http://www.gpsdaily.com/reports/Lockheed_Martin_GPS_III_Team_Completes_Major_Design_Review_999.html. Gibbons, Glen. “GAO Report on GPS Satellite Constellation Status: The Pushback.” 25 May 2009. Inside GNSS. 20 Oct. 2009. http://www.insidegnss.com/node/1527#Baseband_Technologies_Inc_. Gibbons, Glen. “U.S. Congress Working on Appropriations for Loran-C and eLoran as GPS Backup.” 29 July 2009. Inside GNSS. 20 Oct. 2009. http://www.insidegnss.com/node/1615#Baseband_Technologies_Inc_. “U.S. Publishes New GPS Standard Positioning Service (SPS) Performance Standard.” 6 Oct. 2008. Inside GNSS. 20 Oct. 2009. http://www.insidegnss.com/node/847#Baseband_Technologies_Inc_. “U.S.-European Meeting Reaffirms GPS/Galileo Cooperation.” 25 Oct. 2008. Inside GNSS. 23 Oct. 2009. http://www.insidegnss.com/node/894#Baseband_Technologies_Inc_. “Putin Backs $2.62-Billion Addition to Glonass Budget.” 16 Sept. 2008. Inside GNSS. 22 Oct. 2009. http://www.insidegnss.com/node/790#Baseband_Technologies_Inc_; “Glonass Constellation Grows to 17 as Latest Satellites Come On-line.” 14 Nov. 2008. Inside GNSS. 22 Oct. 2009. http://www.insidegnss.com/node/916#Baseband_Technologies_Inc_. “Russia Glonass System to Get Full State Support.” 15 May2009. GPS Daily. 22 Oct. 2009. http://www.gpsdaily.com/reports/Russia_Glonass_System_To_Get_Full_State_Support_999.html. “Russia Launches Three More GLONASS-M Space Vehicles.” 26 Dec. 2008. Inside GNSS. 22 Oct. 2009. http://www.insidegnss.com/node/982#Baseband_Technologies_Inc_; Gibbons, Glen. “Russia Building Out GLONASS Monitoring Network, Augmentation System.” 19 Aug. 2009. Inside GNSS. 22 Oct. http://www.insidegnss.com/node/1631#Baseband_Technologies_Inc_. “Le Bulletin de Spheris N.37.” April-May 2009. Spheris. 22 Oct. 2009. http://www.spheris-fr.com/Info/index.php?RID=5&ACT=telechargerDoc&ID=44. Information-Analytical Center website. 22 Oct. 2009. http://www.glonass-ianc.rsa.ru/pls/htmldb/f?p=202:1:1244260643211211752. Gibbons, Glen. “Russia Building Out GLONASS Monitoring Network, Augmentation System.” 19 Aug. 2009. Inside GNSS. 22 Oct. http://www.insidegnss.com/node/1631#Baseband_Technologies_Inc_. “China to Launch 10 Compass Satellites over Next Two Years.” 8 Dec. 2008. Inside GNSS. 23 Oct. 2009. http://www.insidegnss.com/node/924#Baseband_Technologies_Inc_; “China Aerospace Official Say Compass/Beidou Will Be Complete by 2015.” 19 Jan. 2009. Inside GNSS. 23 Oct. 2009. http://www.insidegnss.com/node/1152#Baseband_Technologies_Inc_; “China Launches Second Compass (Beidou-2) Satellite in $1.46 Billion First Phase.” 18 Apr. 2009. Inside GNSS. 23 Oct. http://www.insidegnss.com/node/1435#Baseband_Technologies_Inc_. “ISRO Extends Raytheon Contract for GAGAN GPS Augmentation System.” 20 July 2009. Inside GNSS. 23 Oct. 2009. http://www.insidegnss.com/node/1604#Baseband_Technologies_Inc_. “Second Phase of GMES Gets Go-ahead atMinisterial Council.” 9 Dec. 2008. ESA. 27 Oct. 2009. http://www.esa.int/esaLP/SEMHO6STGOF_LPgmes_0.html. “New Steps in ESA/Commission Cooperation on GMES.” 28 Jan. 2009. ESA. 27 Oct. 2009. http://www.esa.int/esaCP/SEM27RWPXPF_index_0.html. ESA/GOCE website. 27 Oct. 2009. http://www.esa.int/SPECIALS/GOCE/index.html. “Landmark Year Ahead for Earth Observation Science Missions.” 16 Jan. 2009. ESA. 27 Oct. 2009. http://www.esa.int/esaCP/SEMFCIVPXPF_index_0.html. “OCO Mission Overview.” NASA. 28 Oct. 2009. http://www.nasa.gov/mission_pages/oco/mission/index.html. NOAA website. 28 Oct. 2009. http://www.noaa.gov/. NOAA Satellite and Information Service. 28 Oct. 2009. http://www.ipo.noaa.gov/index.php; Brinton, Turner. “Continuing Instrument Troubles Lead to More Delays for NPOESS.” Space News 20 Apr. 2009: 1+. Skyrocket website. 28 Oct. 2009. http://space.skyrocket.de/. “Vinci Space Propulsion.” June 2009. Snecma. 5 Jan. 2010. http://www.snecma.com/IMG/pdf/VINCI_ang-4.pdf. “More about GOCE and Astrium.” 24 Feb. 2009. Astrium. 5 Jan. 2010. http://www.astrium.eads.net/en/news/more-about-goce-and-astrium.html. “Ares I Five Segment Development Motor on the Move.” 17 Apr. 2009. NASA. 5 Jan. 2010. http://www.nasa.gov/mission_pages/constellation/ares/aresI_dm1.html. “Dawn Spacecraft.” 2009. NASA. 5 Jan. 2010. http://www.nasa.gov/mission_pages/dawn/spacecraft/index.html. “DLR Kontaktiert Erderkundungssatelliten TerraSAR-X per Laserstrahl.” 10 Oct. 2008. DLR S Jan. 2010. http://www.dlr.de/desktopdefault.aspx/tabid-4237/6803_read-14120. For the following sections, see also: Rathgeber, Wolfgang. “Space Policies Issues and Trends in 2008/2009.” 18 May 2009. ESPI Report 18. 2 Jan. 2010. http://www.espi.or.at/images/stories/dokumente/studies/espi%20report%2018.pdf. “ISS Astronauts Complete Spacewalk, Test New Russian Spacesuits.” 5 June 2009. RIANovosti. 7 Jan. 2010. http://en.rian.ru/science/20090605/155180266.html. “Japan Hopes to Turn Sci-fi Into Reality With Elevator to the Stars.” 22 Sep. 2008. The Times Online. 7 Jan. 2010. http://www.timesonline.co.uk/tol/news/science/article4799369.ece. “2009 Northrop Grumman Lunar Lander X PRIZE Challenge.” 2009. XPrize Foundation. 8 Jan. 2010. http://space.xprize.org/lunar-lander-challenge. “About the Google Lunar X PRIZE.” 2010. X Prize Foundation. 8 Jan. 2010. http://www.googlelunarxprize.org/lunar/about-the-prize.